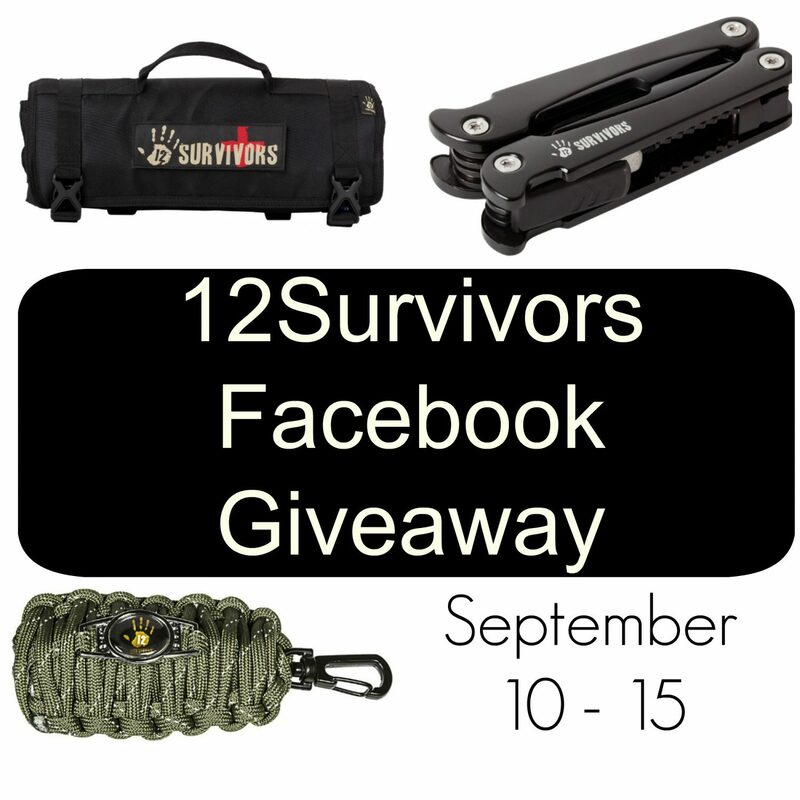 Win a Prize Package from 12 Survivors on Facebook! This giveaway has now ended. Congratulations to our lucky winner! If you have a Facebook account, even if you rarely use it, you have a chance to win a great prize package from 12Survivors, a new survival products company. We have all kinds of giveaways and contests going on this month, and for this one, you’ll need to head over to my Facebook page to enter. The prize package is nifty and oh, so handy. What I like about these prizes is that they form a solid foundation for your survival. With these 2 kits and the multi-tool, you’ll be prepared for emergencies, but plan on customizing them to your own needs. For example, the First Aid Rollup Kit contains the basics for first aid emergencies, but if you have kids or family members with health issues, add the supplies and medications you’ll need to keep them healthy. I always add several doses of Benadryl and a bottle of eye drops for my allergy prone husband. This is a super quick giveaway with only 2 ways to enter. Winners must be 18 years of age or older. Prizes can be shipped worldwide. Winner will be selected on September 16, and notified by email. They have 48 hours to respond or a second winner will be selected. Doesn’t hurt to be ready! Keep trying, Bobby. One of the reasons I use Rafflecopter is that I’m able to offer many different ways to enter. I have 3 more giveaways coming up this month, so your chances just got better! Desperately want…but good luck all! I would love this for me or my Sons. Love your site and all your helpful info. Thanks for the chance to win this! Love all the info on your site, the giveaways are just icing! Great site. Look at it often!! But I can’t figure out how to enter the contest. Give the blog post page a few seconds to fully load. There’s an entry form at the very bottom.